Perfect Body and Zac White share lead singles from forthcoming Split EP! 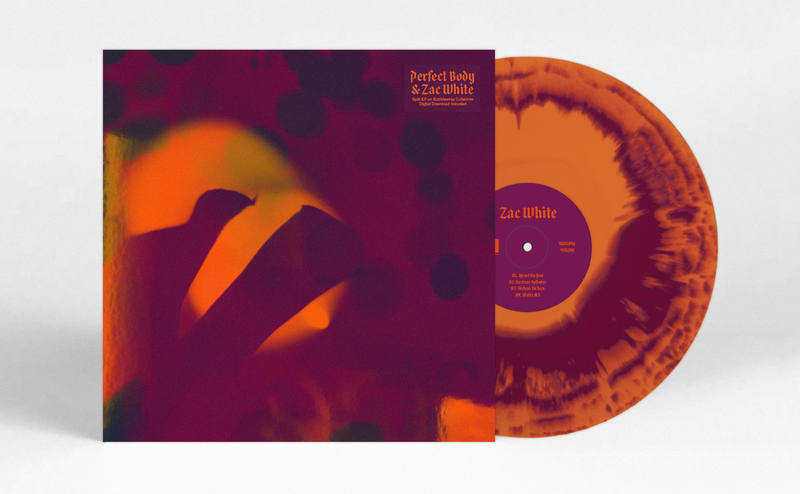 Bubblewrap Collective have announced the release of the new Perfect Body and Zac White Split EP! Lead singles ‘Fields‘ from Perfect Body, and ‘Spent on You’ from Zac White will be available digitally on 12th October. Following on from the success of the 2017 split EP with Boy Azooga and Buzzard Buzzard Buzzard, Bubblewrap Collective brings you two of the most exciting acts on the Cardiff music scene: Perfect Body and Zac White. The record, pressed to limited edition purple and orange vinyl, will be released on November 23rd and features artwork from Cardiff artist and musician Teddy Hunter. The release continues the camaraderie across the Cardiff music scene with Tom Rees (of Buzzard Buzzard Buzzard) producing at Rat Trap studios alongside Zac and Perfect Body. Perfect Body’s new single ‘Fields’ is a glacial gaze trip. that further expands their shivering palette of vast noise pop potential, that rustles with the ghosts of early My Bloody Valentine, Slowdive and woozy 60s psych. Threaded with longing three-way vocals that explore the landscapes of ‘desire’ through tumbling percussion, ethereal synthesizers; and reverb smothered hooks. ‘Fields’ possesses an exciting, nagging pop sensibility that makes you want to press play all over again as soon as it’s over. Perfect Body formed in Cardiff, early 2017, inspired by the sonic experimentation of bands like My Bloody Valentine, Stereolab, and The Brian Jonestown Massacre. Their three vocalists, each with their own style and identities, ensure that Perfect Body’s performances are varied and engaging. Perfect Body is a wall of noise, hazing over and obscuring what is, at its core, pop-oriented songwriting. Their earliest performances took place in Cardiff’s underground, often in practice spaces and house parties: So, by the time Perfect Body emerged on the music scene, they had already sculpted a distinctive sonic identity. The attention gained from their first single, ‘Getting Cold’, saw them supporting the likes of Jen Cloher, Slowcoaches, and The Wytches. Perfect Body recently played a rapturously received set at the much-coveted Rising Stage at Greenman 2018. They were picked out as at one of the Top 10 ones to watch at the festival by Drowned in Sound and BBC Radio Wales broadcaster Adam Walton has been a huge champion of the fast emerging Cardiff band giving their early tracks heavy rotation on his show. Zac White’s new single ‘Spent On You’ is an infectious tune that ties together meditative sun-kissed refrains, wonky percussion and bounding baselines, with shimmering spidery riffs tiptoeing into a heart on the sleeve sing-along. Gathering into a sumptuous crescendo of drum rolls and fuzzy riffs in its outro, this is a delicious slice of hazy pop that just hints at a depth of his songwriting talents. Despite being only 20, Zac White has been playing on Cardiff’s live music scene for over five years. Alongside his early days performing with FUR and part of Lily and White, Zac has been honing his own sound based on influences such as Wilco, Loose Fur, Sonic Youth and Broadcast. His 90s/00s off-kilter indie influenced sound has grown from minimal arrangements with drummer Ethan Hurst into a rollicking, reverb-drenched, garage-psych experience. For his live shows and upcoming EP, accompaniment comes from Tom and Ed Rees of Buzzard Buzzard Buzzard, with whom Zac also plays. He recently supported Heavenly recordings Boy Azooga, who are currently blazing a trail for Welsh bands across the world.